In the latest update, the mailing company addressed the right click feature which has ever since posed as one of the most annoying features on the platform, however, with the latest development the feature now has an extension that makes the menu a lot easier to manage email. Prior to now, You might not have known that you could right-click on emails in Gmail to bring up a short list of common actions that you might want to perform. Now is about as good a time as any to learn about the feature, though, because Google just made it known in its announcement today that it will be expanding the options found in the context menu so you can quickly jump to any action that you may need. As updates go, it’s a pretty simple one: once the rollout hits your account, you’ll be presented with the following list of options when you right-click on an email- adding options to reply, forward, label, move, mute, and snooze emails — options that honestly should have been there for a long time. Anyways, coming at this particular time does not make it any less relevant. The image above shows what the new menu bar looks like, compared to the old one that only contains three options as seen in the image below. The new menu options will start to roll out to G Suite users starting today. A complete rollout of the feature is scheduled to start on February 22nd and will take up to three days to arrive for users. 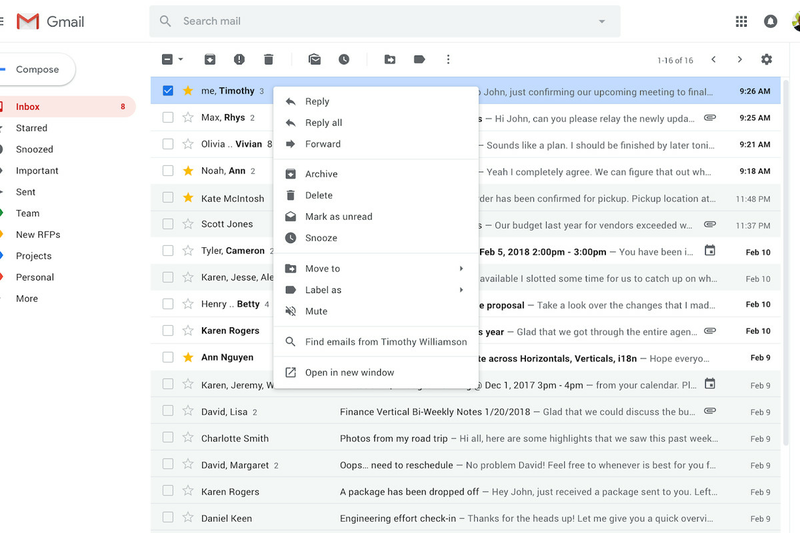 Google has been working to simplify its platform and make the common feature more readily available across G Suite lately, including the adding shortcut to quickly make new documents and sheets and killing off the rarely visited notifications widget.